My new series has me on a search for the best dimsum in Metro Manila! I'm looking for an extensive selection, reasonable price, and of course, excellent taste! Already a legend in the streets of Manila and Quezon City, I visited King Chef Dimsum Kitchen at SM Cherry to get a taste of their famed dimsum! The verdict? Easily one of the best dimsum restaurants in Metro Manila! Like King Chef on Facebook! MILA'S TOKWA'T BABOY & SISIG AT ANGELES, PAMPANGA! During our road trip to Pampanga, we drove on over to Angeles, Pampanga, to visit the famous Mila's Tokwa't Baboy and Sisig to try for ourselves the dishes that made the Mila's name so legendary. 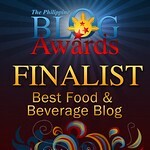 I was totally blown away with everything that was served to us, especially the BBQ Tocino! It was one of the best things I've ever eaten in my life!! MCDONALD'S FOOD AVAILABLE ONLY IN THE PHILIPPINES! Whenever I travel to another country, I'm always curious about what dishes are available in fastfood restaurants that they don't have in the Philippines. So I did a little research on what items McDonald's Philippines has that aren't available anywhere else! On our fifth day at sea on Star Cruises Superstar Virgo, we headed back to Manila. We Went on a tour of the ship's bridge to meet the captain, and we also saw how clean their galley was! As much as we enjoyed the cruise, I was excited to head back to Manila to see my family! I visited Ippudo at SM Mega Fashion Hall and discovered one of the newer items on their menu.. The Yokohama Iekei Ramen and I absolutely loved it! Of course, no meal in Ippudo is complete without an order of their mouthwatering Pork Bun, so I made sure to order one as well! Like Ippudo Philippines on Facebook! The world famous Wolfgang's Steakhouse of New York has opened yet another branch at One Bonifacio High Street! We went to a sneak peek dinner to see what they had to offer, and we were absolutely blown away by their excellent steaks, and other fine dining dishes! And the best part of the evening? I got to meet the man, Mr. Wolfgang Zweiner himself!! Six Doors BBQ Buffet has opened in Uptown Mall in Bonifacio Global City, bringing a whole new dining experience to food loving pinoys! Six Doors is the first restaurant that offers their diners an innovative 3D Mapping Dining experience, to go with its slew of dishes from around the world, that brings to life the term, "World on a plate"! It was also pretty cool because I saw fellow Vloggers TotallyRaq and Mikey Bustos there as well! Like Six Doors BBQ Buffet on Facebook!